The University of Johannesburg (UJ)’s brand has, once again, received international acclaim with its brand and marketing campaign being named as one of the best advertising campaigns in the international business and higher education arenas. The International Association of Business Communicators (IABC), one of the world’s largest communication associations, has awarded the University’s ‘Be CLEAR about your future’ campaign an international Gold Quill Excellence Award as well as the Africa Gold Quill award for its 2012/3 advertising campaign. “Winning a Gold Quill Award puts you in the top ranks of the world’s business communicators. You deserve to give yourself and your team or colleagues a pat on the back,” said Tim Buckley, IABC 2013 Gold Quill Awards chair. Furthermore, UJ’s ‘Be CLEAR about your future’ campaign also received a Bronze award in the 2013 Council for Advancement and Support of Education (CASE) Circle of Excellence Awards, which recognises excellence among higher education institutions. This is the third year that the University of Johannesburg has been acknowledged by CASE. 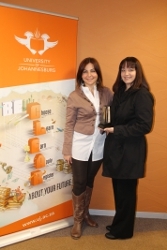 In 2011, UJ received a Gold award, and in 2012 Silver and Bronze awards for its advertising campaigns. Judges for the CASE award said: “Incredibly ambitious campaign with a lot of heart and soul poured into the overall execution and planning”. The ‘Be CLEAR about your future’ campaign is part of the brand development campaign that continues to build on the stature of the University while simultaneously speaking to the youth. The evolution of the brand development campaign focuses on presenting UJ as accessible yet providing excellence in teaching and learning, research and student experience. This award-winning campaign aimed to address a national problem: the lack of understanding among potential students about the process required to become a university student. It therefore addressed the dire need for early student career counselling. R: Register for your first year at UJ if you are accepted. “The University is thrilled to have made its mark in the international marketing and communication arena. Winning the international as well as the Africa IABC Gold Quill Award and being honoured with a CASE award, not only puts the University in the top ranks of world-class business communicators but also reinforces the University’s bold vision to become ‘An international university of choice, anchored in Africa, dynamically shaping the future.’,” says Ms Lesmarie Bentley-Steyn, Senior Manager of Marketing and Brand at UJ, who recently accepted the award at a gala dinner event held in New York. IMAGE: Ms Dale Newman, Marketing Coordinator for Advertising, Social Media and Corporate Marketing Projects together with Ms Lesmarie Bentley-Steyn, Senior Manager of Marketing and Brand.